The newest of the Holland America fleet, Ms Koningsdam boasts traditional Holland America features as well as some new twists, reminding us why cruisers have fallen in love with this line. Whether you cruise to relax or seek new adventures, Ms Konindgsam will bring smiles to everyone. Be one of the first to experience this new ship and immerse yourself in that dream holiday you deserve. With a significant focus on dining, you will be taken on a culinary journey like never before and have the opportunity to dine in intimate venues and make every meal time one to remember. The main dining room spans two floors, with floor to ceiling windows. Custom furniture, modern décor and exciting lighting make it one of the most luxurious dining rooms in the fleet, without mentioning the enticing menu. Aside from the dining room, you can choose to eat in The Pinnacle Grill, Tamarind or Canaletto. When the sun sets, the ship comes alive with an array of highly impressive entertainment. Whether you enjoy a more low-key evening with live music or a grand Broadway-style musical, you can spend your evenings exactly how you want. The BB King’s Blue Lounge will showcase the sounds of Memphis with an eight-piece band, along with a large dance floor to boogie the night away. When you have just about taken everything in, rest assured you will return to a comfortable stateroom to enjoy a peaceful night’s sleep so you are ready to do it all again the next day. 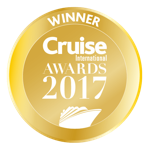 Decorated with neutral décor and modern finishing’s, they are the ultimate cruise rooms. For daytime entertainment, guests can also choose from a range of Explorations Central (EXC) features. These include such opportunities as attending onboard Q&A sessions with local guides, classes relating to the destinations on the itinerary, interactive maps, and exclusively made guidebooks. When you are not indulging in exquisite cuisine, you can enjoy everything the ship has to offer. With something for everyone you can spend your time exactly how you want to. Escape in the Greenhouse Spa, learn to cook in the Culinary Arts Center or stay connected in the Digital Workshop. The Promenade deck encircles the whole ship and lets you experience the true feeling of being at sea. Take a stroll to let the sea breeze hit your face whilst you breathe in the fresh salty air – bliss!